-North+west UK have high rainfall=good supply of water.-SE+midlands have high pop. densities=high water demand, areas of water deficit (demand>supply).-North+west=areas of water surplus(supply>demand). - Since 1975, amount of water used by households in UK had gone up by about 70%. 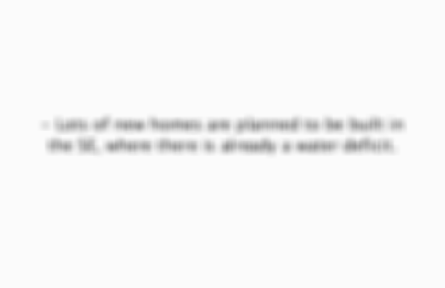 - People have more appliances that use lots of water, e.g. dishwashers and washing machines. - UK pop. 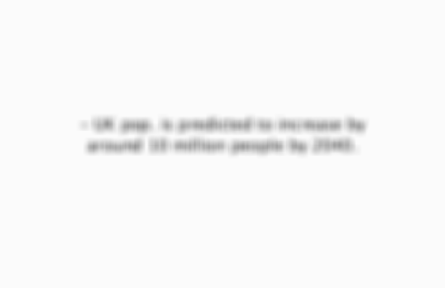 is predicted to increase by around 10 million people by 2040. - Lots of new homes are planned to be built in the SE, where there is already a water deficit. Why is water quality a problem? - Polluted or low quality water reduces the amount available for use = more pressure put on water resources, especially in areas with a water deficit. 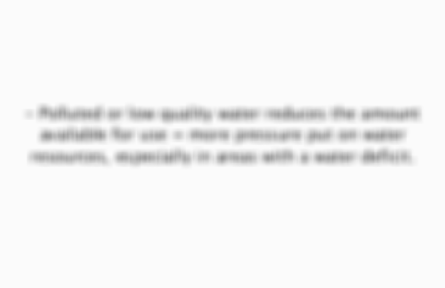 How is water quality lowered in the UK? -Nitrates+phosphates from fertilisers used on crops, washed into rivers+groundwater.-Pollutants from vehicles washed into water sources through runoff when it rains.-Accidental chemical+oil spills at factories pollute local water sources+groundwater. -Up to 80% of water in some parts of S. England comes from ground water, but pollution is affecting the water quality of nearly 50% of groundwater used for UK public supply. - Many groundwater sources closed or have to have expensive treatment. - Improving drainage systems (e.g. by slowing down movement of rainwater to rivers so that pollutants can be broken down in the soil). - Imposing regulations on amount and types of fertilisers and pesticides used. - Transferring water from areas of surplus to areas of deficit can help to deal with the supply and demand problem. - E.g. Birmingham (area of deficit) is supplied with water from middle of Wales (area of surplus). -Dams+aqueducts(bridges used to transport water)=expensive to build.-Can effect wildlife that lives in rivers (e.g. fish migration can be disrupted by dams).-Might be political issues(e.g. people not wanting their water transferred to another area).